Do-it-yourself almost NEVER pertains to electrical work. This is because, for most, electric work is a little bit mysterious and well fear what we don’t know. Not to mention, there is the potential for electrocution, something we average homeowners who are not seasoned tradesman tends to avoid. Certainly, if you are not a trained electrician, there are jobs you should avoid, always deferring to the professionals. However, for small electrical tasks around the house, you might be hard pressed to find a trained electrician willing to schedule a stop at your house for what is not going to make them much money. Routine jobs like changing an outlet or a light fixture are manageable and safe as long as you respect the current and have the right tools. The most important of these tools is the voltage tester. In this article, we outline the various types of voltage testers on the market and how to properly use them to avoid getting zapped over some landscape lighting. 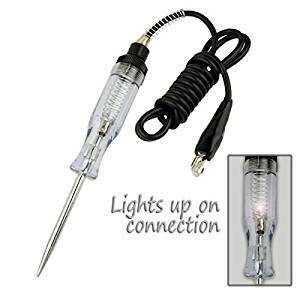 The non-contact voltage tester is the safest way to make sure the power off. The best part is that with this tool there is nothing to fear, as you will never actually have to touch any wires, hence the name. The non-contact tester looks like a small marker. It works by lighting up, beeping, or some combination of both when it comes in contact with a live wire or outlet receptacle. 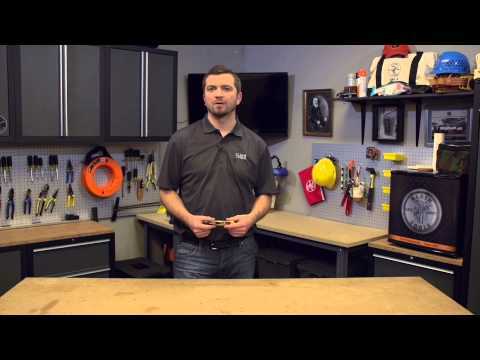 To see the non-contact tester in action, watch this video demonstration from Klein Tools. Cut power to the outlet. You can do this by locating the corresponding room’s power grid on the breaker box. Breaker boxes are typically located in the basement of your home. Sometimes they are placed in garages. Shove the tester nose into the narrow slot of the outlet. The more narrow slow is the one joined to the hot or live wire. The tester will light up or beep if the power has not been cut. This means you did not shut off the right breaker. Once you’ve found the live receptacle, pull the outlet out of its cutout. Push the tester deep into the box to check for other hot wires. These might be wires running to other electrically powered implements throughout the house that happen to cross paths with this switch. Locate those and shut them off at the breaker. Turn the power off at the main panel, then test the light the switch powers to make sure you have shut the right breaker down. Remove the cover plate, revealing the wire terminal that runs to the switch, and press the tester nose close to one each wire on the terminal. If there is more than one switch in that cutout, be sure to test all. Remove the bulb on the fixture that corresponds with the switch you just tested. Press the nose of the tester to the bottom of the socket for voltage. When you do this, make sure the switch is in the on position. Unscrew the fixture from the wall or ceiling where it is fastened revealing the source wires. Test these in the same way, by pressing the tester nose to each wire. PRO TIP: Non-contact voltage testers are battery powered. Double check there are fresh batteries in your tester before you begin checking for hot wires. A tester with dead batteries will not signal if a wire is hot. A circuit tester is mainly used to verify that the circuit of an outlet is working properly. Electrical code requires that any outlet delivering AC power needs a live, neutral, and grounded connection. In some older homes, outlets are not tied to a grounded system. You will recognize an ungrounded outlet as a two prong outlet, or one without the lower, central receptacle. This does not mean no ground wire exists. Often, it is the case that circuit testers are used to determine if an outlet is grounded or if it has the potential to be grounded based on what is behind the outlet in the cutout. You can also test for grounding in a three prong outlet through the third receptacle as seen in this video. A circuit tester is composed of two wire testers, red and black respectively, connected to a digital display screen. When the tester’s wires touch the corresponding wires of an outlet, the digital display will light up and tell you the voltage. 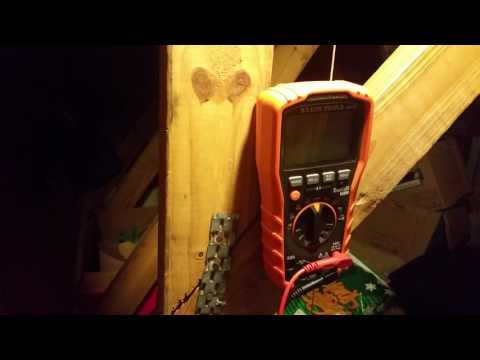 Cut power to the outlet, and confirm with a non-contact tester. Remove the cover plate, and uncap the neutral wires in the box. These will not be connected to the outlet or switch itself, but bundled somewhere in the box. Disconnect the attached wires and spread their ends. Be sure the ends are not touching. Once you have done this and the wires are exposed, turn the power source back on. Confirm which wire is hot with the non-contact tester. Touch the hot wire with one of the circuit tester leads and the ground wire with the other lead. The ground wire will either be green or bare copper. If the outlet is properly grounded, the light on the tester will come on revealing the voltage of the circuit, usually 120. Long time electricians will be the first to tell you that electricity is not to be feared, but respected. The best way to pay the electricity in your home respect and to save yourself from getting zapped is in using some combination of the non-contact and circuit testers when working on switches, outlets, and lights. The non-contact tester is the best tool for double checking that power is off when you are working inside outlet or switch boxes and on corresponding fixtures. Use circuit testers to identify live wires so you know what goes where when rewiring and to test that the circuits in your home are all properly grounded and up to code.